^ Fast Facts. [2015年10月29日]. （原始内容存档于2013年12月27日） （英语）. ^ Dutch Bluetooth inventor honoured in US. [2015年10月29日] （英语）. ^ Newton, Harold. Newton’s telecom dictionary. 纽约: Flatiron Publishing. 2007. ^ Tech History: How Bluetooth got its name. 2008-03-05 [2015-12-10]. ^ Bluetooth Experience Icons (PDF). Bluetooth Special Interest Group. [2016-10-21]. 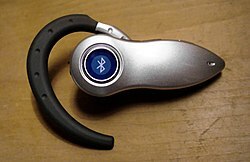 Bluetooth Experience Icons borrow two of these three features: the blue color and the rune-inspired symbol. ^ 工作原理. Bluetooth SIG. [2017-12-18]. ^ Bluetooth Module for microphones. [2014-01-20]. （原始内容存档于2014-02-01）. ^ 简单配对白皮书 (PDF). Version V10r00. Bluetooth SIG. 2006-08-03 [2007-02-01]. （原始内容 (PDF)存档于2006年10月18日）.